Conrad Grebel University College, 2018. Conrad Grebel University College (CGUC) was chartered in 1961, taught its first classes in 1963 and dedicated it's first building (a residence for 106 students) in 1964. Ontario Mennonite leaders established the College when more Mennonite young adults were attending secular universities for training in specialties not available at traditional Mennonite colleges or Bible schools. The possibility of an affiliated college at the University of Waterloo allowed Ontario Mennonites to provide post-secondary education with a relatively small financial investment. Conrad Grebel University College added "University" to its name in June 2001 to recognize its graduate program and to differentiate itself from community colleges. Crucial visionaries in founding Conrad Grebel College included Norman High, Harvey Taves, John W. Snyder, Henry H. Epp and Milton R. Good. J. Winfield Fretz began service as the College's first President in 1963, and made an impact in the Ontario Mennonite community far beyond the College. The Ontario Mennonite leaders initially envisioned a residential college for Mennonite students studying at university in non-theological disciplines. They expected that Conrad Grebel's teaching would be limited to religious knowledge and such other liberal arts courses as would be negotiated with the university. However the College's teaching program rapidly expanded, with an academic office and classroom building added in 1976. The College taught 98 courses in 2017/2018 with 23 faculty and administrators, and 45 adjunct instructors. The College's undergraduate students are registered at, and receive their degrees from, the University of Waterloo. The College established its own Graduate Theological Studies in 1987; these students receive a Master of Theological Studies (MTS) degree from Conrad Grebel University College and the University of Waterloo. 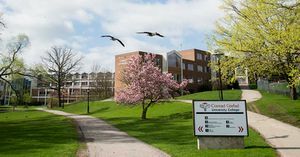 Ontario provincial funding has typically provided half of Conrad Grebel's income through grants and undergraduate tuition fees; the remainder comes from residence income, donations and endowment income, as well as other sales of services. In 2006/07 Mennonite Church Eastern Canada provided about 4% of CGUC's income. Mennonite students have usually filled half the spaces in the residence, but the percentage of Mennonite students in Conrad Grebel academic courses is much less than 10%. This difference has created some dissonance between the residence and academic programs throughout Conrad Grebel's history. At the same time it has reflected the unique mission of the College has it has intersected with the very diverse student body of a large provincial university. The University of Waterloo, itself founded in July 1957, invited a number of Christian denominations to establish affiliated residential schools at the new university. Ontario Mennonites who wished to attend a denominational post-secondary school had been accustomed to studying at one of the Mennonite colleges in the United States (primarily Goshen, Eastern Mennonite, or Bethel), or at Bible colleges in Ontario or Western Canada. The new college affiliation model at the University of Waterloo provided an opportunity for Ontario Mennonite leaders to assess whether the number of Mennonite students attending secular universities in Ontario warranted a Mennonite-sponsored affiliated college. Canadian Mennonite demand for post-secondary education had rapidly increased following World War II—by 1959 over 500 Mennonite young adults were attending universities in Canada. The vision for Conrad Grebel College emerged from 1959 conversations within the Kitchener-Waterloo Inter-Mennonite Ministers' Fellowship. A subcommittee composed of Harvey Taves, Henry H. Epp and Ross Bender prepared a report on "Mennonites and Higher Education at University of Waterloo"; this report shaped further formation of the vision. The name "Conrad Grebel College" was selected 6 May 1960 by a representative leadership group that preceded a provisional board that organized 20 June 1960. Norman High chaired the provisional board. High was soon to become the first Dean of Arts at the University of Waterloo, and was crucial in guiding the nascent College through the treacherous academic waters occasioned by the conflict between the University of Waterloo and its smaller parent—Waterloo College, later Waterloo Lutheran University, and still later, Wilfrid Laurier University. The Ontario Mennonite leaders envisioned a Mennonite residential college for students studying in non-theological disciplines at a secular university. They believed the new college's teaching would be limited to religious knowledge and such other liberal arts courses as would be negotiated with the university. The "Mennonites and Higher Education" document also emphasized the unique opportunity to help shape the spiritual climate of an emerging university. The inter-Mennonite vision for higher education had its roots in the experience of the Conference of Historic Peace Churches (CHPC, later merged into Mennonite Central Committee Ontario). This positive experience of these small denominational groups in CHPC made cooperation in higher education seem to be possible; indeed the "Mennonites and Higher Education" report suggested the CHPC might sponsor the new College. Conrad Grebel College's provisional executive committee included one member of the Mennonite Conference of Ontario (Norman High), one United Mennonite (Henry H. Epp), one Mennonite Brethren (Henry H. Dueck), one Amish Mennonite (Orland Gingerich), one Brethren in Christ (Harold Nigh), and one member of the independent Stirling Avenue Mennonite congregation (Milton R. Good). 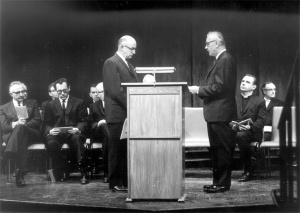 The initial Board of Governors continued this coalition until mid-1962 when the Brethren in Christ and Mennonite Brethren withdrew, partially due to financial considerations, and partially due to concern about the existing affiliation between Mennonite Brethren Bible College and Waterloo College (later Waterloo Lutheran University). The remaining partners continued, and ultimately all of them became part of Mennonite Church Eastern Canada (MCEC). This board governance structure continued through the years, with the later addition of members representing students, faculty and alumni. When Stirling Avenue Mennonite Church affiliated with both the United Mennonites and Mennonite Conference of Ontario, its representatives were dropped from the board. 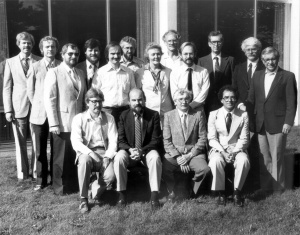 When the three remaining conferences merged into the Mennonite Conference of Eastern Canada (MCEC) in 1988, the College's board had a majority of its members (nine) elected by that conference. Initially there were three board sub-committees—Academic Affairs, Finance, and Student Services. The latter committee ceased to exist in 1968 when the inter-Mennonite Mission and Service Board agreed to take over responsibility for supporting Mennonite students at other Ontario universities. A Development Committee was added in 1994 as the necessity for greater effort in this area became evident. The board's executive committee also served as a personnel committee as required. The Ontario government granted a provincial charter to Conrad Grebel College 21 April 1961; the College's first Board of Governors organized 14 October 1961, chaired by Milton R. Good. J. Winfield Fretz began service as the College's first president 1 July 1963 and taught the College's first courses that fall. The original residence building, later named Founders Hall, was opened to students in fall 1964.The residence initially provided dorm space for 106 students, as well as a small apartment for the Residence Directors, several administrative and faculty offices, a board room, a dining room for 125, a small library and archives area, and a chapel designed to seat 150. The cost of construction and furnishing the residence was $750,000. After a new academic building was completed in 1976, the residence was able to hold 120 students. This remained constant until 2003 when 56 spaces were to be added in dorm and apartment housing. The academic building was completed in 1976 at a cost of $1.0 million. This provided office and classroom space, greatly expanded space for a library and archives, and a "Great Hall." This also released space for additional dorm rooms in the residence. The College completed an addition to, and major renovation of, student space in fall 1992 at a cost of $2.2 million. Funding for this project was through the congregations and individual donors. The fund drive did not meet its objectives, and two additional phases of (music recital hall, expanded library / archives and classroom space) were not completed. The fourth major capital project, estimated at $4.1 million, added residence space and completed the dream of linking the two buildings with an "atrium." Construction on this project commenced in fall 2002. It was funded entirely through private donations and a mortgage on the added residence rooms. The fifth major building project, at $8.7 million, completed in 2014, added music and community spaces, increase library and archive capacity, and established the Mennonite Savings & Credit Union Peace Centre. The sixth major building project, estimated at $6.6 million in 2018, will expand the Kitchen and Dining Hall. An elevator and stairway to the chapel foyer is also anticipated. Conrad Grebel College was one of four denominationally-related Colleges affiliated with the University of Waterloo (the others are St. Jerome's (Catholic), Renison (Anglican) and St. Paul's (United Church of Canada)). All Conrad Grebel undergraduate students have registered at, and have received their degrees from, the University of Waterloo. Undergraduate courses taught at the College have been approved by the University and faculty members at the College serve as members of university academic departments, though decisions on hiring, continuing contracts and promotions remained at the College. The number of courses taught grew from two in 1963/64 (The Radical Reformation and Sociology of the Family) to 53 in 1973/74 to 113 in 2001/2002 to 222 in 2017/18. Two other significant changes in the mid-1970s had long term impact on Conrad Grebel's academic program. The various Religious Studies faculties within the University of Waterloo and its affiliated colleges began to function together as a department, giving higher profile to Grebel's courses on the university campus. In January 1977 the University Senate formally approved an interdisciplinary undergraduate degree program in Peace and Conflict Studies (PACS). This was a unique program within Canadian academia, and included research and service aspects in addition to the academic program. The 1980s might be described as the "golden era" in the College's first 40 years. The number of full-time faculty increased from nine to thirteen in that decade, with the number of administrators increasing accordingly. "Course-student" enrolment hit 3000 during the decade, and a new Graduate Studies Program began in 1987, with the College offering a Master of Theological Studies degree. The primary academic visionary during the 1970s and 1980s years was Rod J. Sawatsky, the Academic Dean who arrived at Conrad Grebel in 1973 and served in that role until 1989, followed by a five-year stint as president of the College. Sawatsky attracted strong faculty members to the college and carried a major role in all academic initiatives during those years. Ultimately some of these visions outstripped the College's financial realities, and contributed to the financial and visionary crisis of the 1990s. A choral music tradition began early at the College. Gerald Loewen, a teacher at Rockway Mennonite School, directed the first college choir in 1964; its inaugural performance was at the College's dedication in October 1964. Helen Martens, the first music faculty member, led the college choir in 1965/66; it performed at Parents Day in October 1965, as well as two university events, a Christmas program, and in a number of local congregations. After 1966/67, however, the choral program lapsed, and Martens turned her energies to the Inter-Mennonite Children's Choir. When William Janzen joined the faculty in 1973, an orchestra and a chamber choir were again established. When Len Enns and Wilbur Maust joined the faculty, a Chapel Choir and University Choir were added to the mix. When Helen Martens came to the college she began as a member of the University of Waterloo's Fine Arts Department. However the University of Waterloo began to offer its music major through Conrad Grebel College in 1973/1974. This was followed by formation of the Music Department in 1977, together with an undergraduate honors option. The Music program soon became the largest at the College. By 1980/81 over half of Conrad Grebel's course enrolments were in Music. As enrolment in other disciplines increased the percentage settled at slightly above 40%. The department grew to a maximum of six fulltime faculty members in 1989. The difficult years of the 1990s saw this slip to four, although the level of teaching remained constant. Each of the long term music faculty members shaped the music program in unique ways. Len Enns and Carol Ann Weaver were the primary choral music composers. Helen Martens nurtured the children's choir and was a recognized scholar on Hutterite music. Musicologist Wilbur Maust ran a highly successful study program on Music in Vienna for many years. David Huron attracted electronic and computer music students until he left to teach at Ohio State University. Ken Hull brought a much-appreciated emphasis on worship and music. In 2017/18 the music faculty consisted of Laura Gray, Kate Steiner, Karen Sunabacka and Mark Vuorinen. The College wanted to initiate a Peace Studies Institute quite early in its history. In 1971 the Board of Governors established a committee to "explore the feasibility of establishing an Anabaptist-Mennonite Peace Studies Centre on the Conrad Grebel campus." Initially it was intended to include both study of the Mennonite heritage as well as "study and research of ways [the Mennonite] commitment to the peace principles can be employed in the present and the future." The center would utilize both historians and social scientists. The first Director of Peace Studies was Donovan Smucker, who had come to the College in 1970. Smucker initiated a Peace Day, and helped to organize various symposia on peace and non-violence themes. Conrad Brunk's arrival as the new Director in 1976 brought the informal establishment of the Institute of Peace and Conflict Studies (IPACS) and formal approval of an inter-disciplinary program in Peace and Conflict Studies (PACS). The first students graduated with the PACS option in 1979; by 1997 University of Waterloo 140 students had graduated with this option. The number of students who took PACS courses also rapidly increased—from 20 in 1976/77 to 447 by 1994/95. In 2005 PACS began to offer a major in Peace and Conflict Studies and in 2012 it offered a Master in Peace and Conflict Studies (MPACS). It was designed as a course-based, professional graduate program open to both full-time and part-time students. IPACS activity centered on colloquia series, support for the Student Peace Society, and its supervision of the research and educational activities of Project Ploughshares researcher, Ernie Regehr. Brunk's own emphases on philosophy and ethics brought an academic flavor to the early PACS program. In 1999 IPACS began a Certificate Program in Dispute Resolution and Conflict Management under the leadership of Mary Lou Schwartzentruber. PACS' student internship program emerged as an important part of the program when Ron Mathies became the director of the Institute in 1985. From 1985/86 until 1997 108 students had completed an internship with 40 organizations in 38 countries. About a third of the students served their placement with Mennonite Central Committee. In 1997 Lowell Ewert, a trained lawyer, brought a particular emphasis on human rights to the PACS program when he assumed leadership. In 2017/18 the PACS faculty consisted of Jennifer Ball, Marlene Epp, Lowell Ewert, Nathan Funk, and Reina Neufeldt. Conrad Grebel's Religious Studies faculty members were always few and somewhat eclectic, providing less of a core specialization than would have been possible in a larger department. John W. Miller, an Old Testament scholar, also engaged in sometimes controversial historical Jesus studies. Tom Yoder Neufeld's teaching in New Testament was recognized in a teaching award from the university. Theologians Rod J. Sawatsky and Jim Reimer fully engaged theological debate with their peers both within and outside the Mennonite world. Derek Suderman (Old Testament) and Jeremy Bergen (Theology) were younger scholars who joined the faculty in 2006 and 2008 respectively. In 2013 Alicia Batten joined the faculty followed by Carol Penner in 2016. Although never separate departments, Conrad Grebel has counted highly-regarded historians and sociologists among its faculty. Sociologists J. Winfield Fretz and Cal Redekop had high profiles in the scholarly community that included major research on Mennonite topics. Fretz's work with and about the Old Order Mennonites was particularly appreciated. Frank H. Epp was the first Canadian Mennonite historian to work across the many Mennonite traditions in Canada. He wrote a multi-volume history of Mennonites in Canada that was the standard reference for over two decades. Conrad Grebel has also been known for its scholarship in 16th century Anabaptism, with a succession of recognized scholars in the field—Walter Klaassen, Werner Packull and C. Arnold Snyder. Marlene Epp joined the faculty in 2000 and Troy Osborne in 2011. After some years of discussion Conrad Grebel began a graduate program in 1987, offering the Master of Theological Studies (M.T.S.) degree. By its second year the program had 31 students in 15 courses. It described itself as "evangelical, ecumenical and Anabaptist-Mennonite in focus." By 2001 it had graduated 34 students, and had forty students in 84 course enrolments. A "ministry stream" was added in 1998 as Conrad Grebel worked more closed with the Mennonite Conference of Eastern Canada's Pastoral Leadership Training office. This marked a deliberate shift toward Mennonite pastoral training in Ontario. In its earlier years, the objective had been on academic theological study. Jim Reimer was the director of Graduate Studies from its inception until June 2000 when Tom Yoder Neufeld assumed this responsibility through June 2006. The directorship then shifted to Jim Pankratz in the Dean’s office until his retirement in 2014 when Jeremy Bergen assumed the role. Graduate studies took some years to find its place at the college. Even as it began talks began within the university on establishing a M.A. in Religious Studies that would fold the M.T.S. degree into the larger M.A. stream. This conversation failed, but efforts continued to strengthen the program through consortia arrangements with other theological schools in Southern Ontario. Finally, in 2007 when the University of Waterloo focused on expanding its graduate offerings, and the Ontario government expanded funding for graduate studies, Graduate Theological Studies became a joint program of the University of Waterloo and Conrad Grebel University College. In 2017-18 enrollment was at an all-high with 45 students. The Institute of Anabaptist Mennonite Studies began informally in 1973 under the leadership of Walter Klaassen. Early activity focused on "Friday afternoon seminars" featuring Conrad Grebel faculty or guest lecturers, and the sponsorship of oral history projects. When Calvin Redekop became director in 1982 IAMS shifted more to large academic conferences (e.g. Mennonite Identity) and formal publication of collected papers from the conferences. Sam Steiner became director after Redekop's retirement in 1990, and the focus shifted to support of specialized publication projects related to Anabaptist-Mennonite themes. Marlene Epp became director in 2006. The refereed journal, The Conrad Grebel Review, began in 1983 with Walter Klaassen as editor. Published three times a year, the Review's provided "reflection on a broad range of contemporary issues from the vantage point of the Christian, and in particular, of the Anabaptist-Mennonite traditions." In addition to Walter Klaassen, editors have included Rod J. Sawatsky, C. Arnold Snyder, Marlene Epp, Jeremy Bergen, Derek Suderman and Stephen Jones. Particularly in its early years the Review was a major forum for theological debate within the Mennonite academic community, though its circulation has generally been just above 400 per issue. TMTC began as a Mennonite presence at the Toronto School of Theology in 1990. It was governed by a board representing various Mennonite institutions of higher education, including Conrad Grebel College. TMTC facilitated graduate-level study in theological areas linked to the Anabaptist-Mennonite tradition. Conrad Grebel College assumed administrative responsibilities for TMTC in 1999, and integrated it more closely with Conrad Grebel's graduate studies program. A. James Reimer was the founding director, and served as director and/or academic advisor until 2010. Lydia Harder, Jim Pankratz, John Rempel and Jeremy Bergen have also served as director. In 2017 Kyle Gingerich Hiebert began service as director. The founders of Conrad Grebel College hoped the percentage of Mennonite students in residence would be 60-70% However, in the first five years the percentage ranged between 42% (1965/66) and 52% (1966/67). The United Church consistently provided the second highest numbers. By 1972/73 the percentage had dropped to 22%, but in the mid-1970s the Mennonite percentage had rebounded to 50%. With occasional dips this level continued into the next century. In 2017-18 34% of Grebel students identified themselves as Mennonite. Associate students existed from the beginning of the college, though originally they were known as non-resident students. The College provided a limited number of study carrels for these students. In later years "Associates" became more integrated into student life, including a position within student government. The number of associates ranged up to 75; in some years it was limited only by the restriction on the number of persons who could be seated at the popular Wednesday evening community suppers. Student Council, known as the "Coordinating Committee" until the 1990s, has experienced the usual limitations of bodies with limited continuity through the years. Most years students sat on the board of governors, and more recently on the College Council. The student yearbook, Jahrgeist, began publication in 1976 and has been published annually with few exceptions. The student newspaper, Grebelspeaks (known as the Conrad Rabble until the 1980s), has appeared every six weeks or so since the 1960s. Both publications have almost entirely student-run without close oversight by faculty or staff. Other student activities have included sports activities as part of the universities intramural program, beginning of year orientation activities, including the annual retreat to Silver Lake Mennonite Camp (later to Camp Trillium), lavish end of term banquets, a Family/Fall Fair Day, and beginning in the 1990s a baccalaureate/convocation program to recognize graduating students. The prominence of the co-op program has always had a major influence on residence life, as significant numbers of students move in and out of the residence each semester. This lack of continuity, combined with the tendency of upper year students to live off campus with other former Grebel residents, has meant major changes in residence life and culture each year. Three long term Deans of Students have given leadership to the residence program—John D. Rempel (who also served as chaplain many years), Gloria Eby and Mary Brubaker-Zehr. During the latter's years the Conrad Grebel residence was ranked as one of the finest on Ontario university campuses. The patterns of formal worship began with the opening of the residence in 1964. For one semester the "College Church" met on Sunday mornings. Thereafter this changed to Sunday evenings in order to allow student participation in local congregations. The Wednesday afternoon chapel (first called "vesper services") began with the opening of the College, although the meeting time shifted from 5:15 p.m. to 4:30 p.m. The initial vision for College religious life included a congregation with formal student membership during the academic year, including election of deacons and semi-annual celebration of the Lord's Supper. Regular participation in the congregation ranged from the 20s to the 50s. However, in the late 1960s and early 1970s the church/chapel worship services fell into decline. In 1969 chapel services were suspended by Christmas because of a sharp decline in participation. The following year Sunday chapel services lasted only two months before being discontinued again. Some small group Bible studies did continue during these years. When a new Director of Residence was hired in 1971, the job description did not include the title of chaplain. Religious life revived with the coming of John Rempel in 1973. Regular chapels resumed, with attendance ranging between 20 and 100. As well Sunday evening Bible studies resumed. The time slots for chapels varied during Rempel's initial years—ranging from Sunday mornings, Sunday evenings, Sunday afternoons, Tuesday afternoons, Thursday afternoons, Wednesday mornings and Wednesday afternoons. By winter 1976 the Wednesday afternoon slot prior to community supper became the norm. By 1981 the Wednesday chapel service also became more clearly identified as a "college" chapel service, with the Sunday chapel remaining more student-focused, and thus more experimental and personal. By 1975 half the chapel speakers were students, with the chaplain, faculty members and guest speakers filling the other slots. The chapel committee, composed of students, the chaplain, chapel choir director and another faculty member, provided most of the leadership in shaping these services beginning in the Rempel years and continuing into the new century. The popular beginning-of-year student retreat began both as orientation to the College and to the chapel program and college congregation. The first retreats were held at the Kiwanis Camp at Paradise Lake, but by 1970 this retreat shifted to Silver Lake Mennonite Camp near Sauble Beach on Lake Huron where it was an important annual event until 2005. The venue then moved to Camp Trillium near Waterford, Ontario. Tensions between the residential program and academic program emerged early in the life of Conrad Grebel College, particularly after the percentage of residential students in non-liberal arts programs increased. In his final report as president of the College, J. Winfield Fretz said one of his greatest disappointments was the failure to achieve a sense of community at Conrad Grebel—the residential students' strong sense of cohesion did not include Grebel faculty and staff. He suggested three reasons for this: the lack of recurring interaction between faculty and students in learning/teaching situations; the lack of control over scheduling of activities because of the affiliation with the university; and the "fluidity" in the student population, particularly because of the popular co-op program at the university. One continuing point of contact through the years was the Wednesday evening community suppers. These began as more formal meals, but even when the formality decreased these continued as an occasion when faculty staff and students ate together. Initially supporting Mennonite conferences and congregations primarily contributed to capital expenditures. 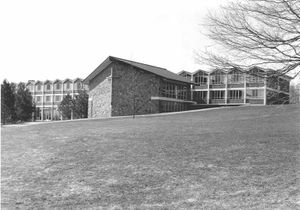 The fund drive for the 1964 residence building went well, and donation targets were met within six years. Until 1970, the conferences also made some donations to operating expenses—usually less than $20,000 annually. By 1970, when the residence building's non-mortgaged debt was fully paid, this support had dwindled to less than $1/member, and by 1971/72 was under 50¢/member. This did not create a problem for the College initially, since the funding formula between the affiliated colleges and the University of Waterloo paid Conrad Grebel well for the teaching it did, particularly in its large sociology classes. However the unintended result was that "ownership" by the conferences and congregations lessened with their financial commitment. The College "didn't need" the constituency, and thus felt less accountable to it. Recognizing the folly of this approach, Frank Epp worked hard during his administration to increase conference giving to the operating budget even as he was fund raising for the new administration building that was completed in 1976. By the time Epp left office in 1979, he had increased conference giving to $65,000 annually. During Ralph Lebold's tenure the conference support gradually increased to $170,000. Lebold also worked to build individual and corporate support—reaching $65,000 in that area by 1989. The 1990s brought a time of crisis for the College both financially and in vision. It began optimistically with a new President (Rod J. Sawatsky), a new graduate studies program, and 24 faculty members and administrators. In addition, the new Mennonite Conference of Eastern Canada has approved an ambitious capital fund drive that proposed a $3.0 million expansion at the College for a concert hall, library/archives space, and additional classroom and office space. The capital campaign quickly ran into difficulties and Ontario government funding that had been expansionary for many years suddenly became restrictive, and provided no new financial assistance for expansion-minded programs like the College. The capital campaign only allowed the building of a truncated Phase 1A in 1992. This phase included renovations in the Residence Building and the addition of expanded student services space. The conference funding toward the operating budget also flattened, inching to $185,000 by 2001 and decreasing to $154,000 by 2017/18. By the fall of 1995 the number of faculty and administrators had shrunk to 16. Retiring faculty members were not replaced, which meant the college no longer had fulltime professors in Sociology or Old Testament. An acrimonious conflict within the college led to the elimination of a tenure-track position in Mennonite history in 1995, ostensibly for purely financial reasons but with multiple layers of conflict fed by increasing pessimism. The dust was not settled before Rod Sawatsky left to become President of Messiah College in Grantham, PA, followed by more staff reductions in 1995. John Toews' arrival in January 1996 thus came at a dispirited time. The College had run major operating deficits for three consecutive years, depleting its reserves and raising debt to dangerous levels. Although staff reductions did not entirely cease (two positions in the library/archives were eliminated in the second half of the 1990s), the financial status of the College improved markedly during Toews' tenure. He eliminated the College's debt, increased individual and corporate giving to the annual fund from $45,000 to almost $300,000, gathered funding for a new building project, and resumed hiring new faculty for the first time since the 1980s. Upon Toews’ retirement in December 2002, Henry Paetkau picked up the presidential reins. He continued the momentum of balancing the budget and worked to strengthen the connection to the Mennonite Church Eastern Canada constituency. The groundwork for another capital build and a Masters in PACS was in place in 2011. The College was also beginning a run of faculty retirements. Susan Schultz Huxman arrived in July 2011 coming from Wichita, Kansas, bringing her expertise for institutional branding. She continued the work of the capital building project and expanded it to include the Kindred Credit Union (formerly MSCU) Centre for Peace Advancement. She departed Grebel in Fall 2016 to assume presidential responsibility at Eastern Mennonite University. Marcus Shantz brought a business and law background to lead Grebel into the next phase of growth. In 2017-18 new building plans were introduced to update and expand the kitchen and dining room. Until the formation of the Mennonite Conference of Eastern Canada in 1988, the Conrad Grebel Board of Governors was composed of three representatives from each of the supporting conference, plus the independent Stirling Avenue Mennonite Church. The latter joined both the United Mennonite and Mennonite Conference of Ontario conferences in 1976. However organizational complexity tended to separate the College from its supporting conferences. Beginning in 1974 the College, as an inter-Mennonite project, became accountable to the new Inter-Mennonite Conference (Ontario), an unincorporated association created by the United Mennonite, Western Ontario Mennonite, and Mennonite Conference of Ontario. The College was accountable to the Inter-Mennonite Executive, all budgetary issues still needed to be approved at the separate conference sessions. Thus most requests went to one level of governance, with final decisions made at another. Some clarity to this came with the new Mennonite Conference of Eastern Canada, which elected a majority of the College's Board of Governors. The Conrad Grebel College Women's Association organized in May 1965. This association helped with fund-raising activities for the College, held two public events a year, and provided some hostess services for college events and social occasions. The association's role was more important in the college's earliest years when the number of staff was limited. The association also helped to initiate the Inter-Mennonite Children's Choir, and in its later years, worked at relationships with international students. The Association ended its activities in 1984. The Inter-Mennonite Children's Choir began as a "choir school" on the encouragement of the Women's Association of the College. Helen Martens, assisted by Lois Snyder began the school in October 1968. The capstone event was a trip to England and Europe with the choir in 1980. Martens continued as the director until 1981. A series of directors and volunteer committee continued to provide leadership in subsequent years, though the close link to the College decreased after Martens' departure. The Music-Lecture Series began in 1967/68 with four programs—a concert by David Falk, a concert by violinist Rupert Hohmann, the Winnipeg Mennonite Children's Choir and a lecture by Anabaptist scholar, Frank Littell. During its prime years six or more events were sponsored annually, with "season ticket" sales approaching 500. The series began to encounter increased competition from other musical venues, and concluded activity in 1977. This activity, to some extent, was replaced by public Noon Hour Concerts that began in the fall of 1977. These were sponsored by the Music Department. Although Menno Singers (founded by Abner Martin in 1955) preceded Conrad Grebel College, Menno Singers began to use rehearsal space at the College, and reached an affiliation agreement in 1974/75. On the most basic level this meant some sharing of choral music. The formal affiliation relationship lasted only a year, but Menno Singers continued to use the College for rehearsal on an ongoing basis. Project Ploughshares, founded in July 1976 by Ernie Regehr and Murray Thomson, developed into a substantial non-governmental organization (NGO) supported by a variety of denominational groups, development agencies and individuals. The focus of Project Ploughshares was public education and research, with the later based at Conrad Grebel College. Its national offices remained at Conrad Grebel College until the summer of 2002. Ernie Regehr as Project Ploughshares researcher affiliated with the College's Institute of Peace and Conflict Studies. Research staff for Project Ploughshares continued to increase over the years, but ultimately only Regehr, as "Research Director" for the Institute of Peace and Conflict Studies and an Adjunct Associate Professor remained formally affiliated with the College. The Network emerged from a coalition of community-based conflict resolution agencies across Canada. Various Mennonites had provided leadership in this movement, and planning for a national conflict resolution "network" began in 1984. Dean Peachey became the national coordinator, operating from offices in Kitchener, Ontario. In 1992 The Network moved to office space at Conrad Grebel College, where it remained until summer 2002. The Network maintained a strong educational program on conflict/dispute resolution and became a major source of training materials in this area. The Network closed its doors in 2005. The School of Adult Studies program was one major effort of the College to reach out to its constituency with non-academic programming. It began already in the mid-1960s and continued until 1983. A wide range of programming was offered. For example, in 1974/75 fourteen programs attracted 527 participants. Businessmen's banquet and seminar featuring Henry Rempel, Art DeFehr and Cal Redekop attracted 130 persons; a consultation on "the future of the congregation" attracted 100 persons. Other programs ranged from a Parables Seminar offered over six weeks, a church librarians' workshop, a choral director's workshop, a consultation on Historical Jesus Studies with Leander Keck, a "Sunday Evening Players" drama group led by Bertha Landers, and a work shop for house churches. For many years this program was coordinated by Doris Gascho. The School of Adult Studies was replaced by a Community Education Program, however this program did never achieved the success of its predecessor and was eventually wound down. The Mennonite Historical Society of Ontario was formally organized in June 1965; it was one of the first priorities of J. Winfield Fretz. Fretz was the Society's first president, and the organizing impetus for the group. The Society, originally identified as an "auxiliary" of the College, has always had its mailing address at Conrad Grebel, and has assisted in several College programs. For example the Society helped to furnish the Brubacher House on the North Campus of the University of Waterloo, and helped to solicit materials for deposit in the Mennonite Historical Library and Mennonite Archives of Ontario. The Brubacher House (first known as the "Schmidt House") was one of a number of formerly Mennonite farmhouses on land purchased by the University of Waterloo when it was established. Conversations between the College, the Historical Society and the University about preserving the house began as early as 1967. The project stalled when the house was gutted by fire in spring 1968. However the restoration was completed in 1977, and Conrad Grebel College, together with the Mennonite Historical Society of Ontario, became responsible for furnishing the House and providing educational programming, and finding custodians/interpreters to live in the apartment on the second floor of the House. A Brubacher House Committee composed of Conrad Grebel staff and Historical Society members have given oversight to the program. The Centre for Peace Advancement, which opened in June 2014, has recognized the value of collaborative, inter-disciplinary, and multi-sector approaches to the advancement of peace. The CPA has been home to a variety of participants (called Core Collaborators) involved in the work of advancing peace. The space (Affiliate Offices, Epp Peace Incubator, Grebel Gallery, Community spaces) is occupied by peace scholars from the University of Waterloo, as well as practitioners from local peacebuilding organizations. Paul Heidebrecht became director in September 2014. The Conflict Management Certificate Program began in 1999 and offers skills-based conflict management training. Individuals take workshops for professional development or work towards a certificate offered in “Conflict Management and Mediation” and “Conflict Management and Congregational Leadership. Customized training on conflict management topics is also provided. In 2013 MCEC and Conrad Grebel formed a partnership to develop a non-formal educational program. In 2015 the Anabaptist Learning Workshop launched with MCEC providing most of the funding and Conrad Grebel providing most of the administrative support. Workshops began in fall 2015. ALW has created learning opportunities for those exploring the intersection of Anabaptist-Christian faith and contemporary life. It's intended to be a program of lifelong learning for lay people, church leaders, pastors, seekers, new Canadians and others. Defining alumni at Conrad Grebel University College has always been challenging, since undergraduate students are formally registered at the University of Waterloo. The definition used in 2002 included undergraduates who had lived in residence or been associate students one term, or had minors or majors in Music or Peace and Conflict Studies. Using this definition there were 2200 alumni by 2002. The Alumni Association has struggled to maintain momentum over the years; the College began putting increased staff efforts into this area in the 1990s. Some well known alumni of Conrad Grebel University College have included CBC broadcaster Eric Friesen; Project Ploughshares founder Ernie Regehr; Seattle Post-Intelligencer journalist Ruth Teichroeb; Conflict Resolution Network Canada Co-Executive Director Kathleen Cleland Moyer; MCC liaison to the United Nations John D. Rempel; and Deputy Minister of Industry Canada, and later Senator, Peter Harder. Conrad Grebel University College Archives at the Mennonite Archives of Ontario. Epp, Marlene. 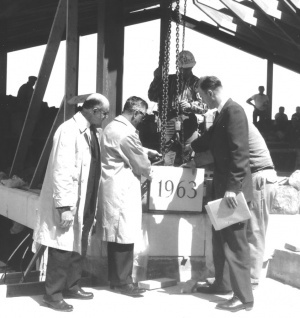 Bridging Mind and Spirit: Conrad Grebel University College, 1963-2013. Waterloo, Ont. : The College, 2013. Steiner, Sam. "Conrad Grebel University College (Waterloo, Ontario, Canada)." Global Anabaptist Mennonite Encyclopedia Online. October 2018. Web. 21 Apr 2019. http://gameo.org/index.php?title=Conrad_Grebel_University_College_(Waterloo,_Ontario,_Canada)&oldid=162276. Steiner, Sam. (October 2018). Conrad Grebel University College (Waterloo, Ontario, Canada). Global Anabaptist Mennonite Encyclopedia Online. Retrieved 21 April 2019, from http://gameo.org/index.php?title=Conrad_Grebel_University_College_(Waterloo,_Ontario,_Canada)&oldid=162276. This page was last modified on 29 October 2018, at 13:49.